July 18 — One of the toughest tasks emergency responders face during natural disasters is transporting medical supplies when roads are flooded or destroyed. Drones could eradicate those barriers by delivering the supplies. At least, that's the premise of a new project under development by Johns Hopkins University and a drone delivery service provider, Flirtey. 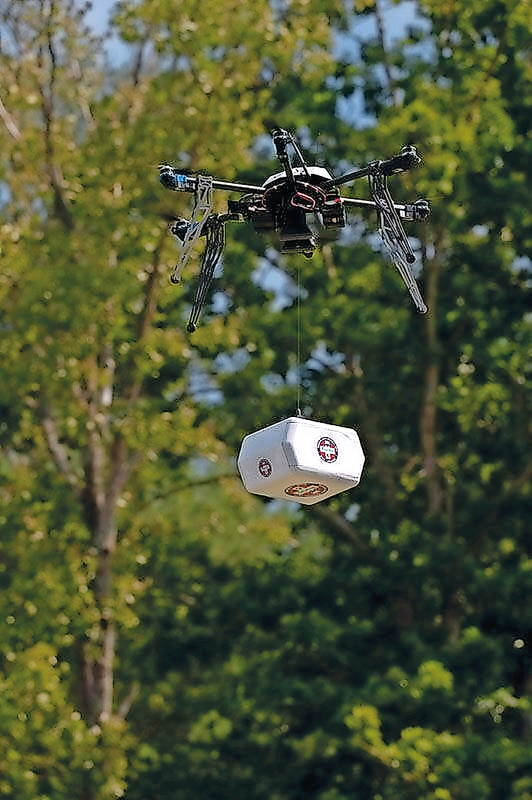 In June, the two conducted the first successful U.S. pilot program of a “ship-to-shore” drone delivery of medical supplies on the New Jersey coastline. Medical ships or barges can be sent to the shores of countries in need, parked there and used as a base to perform medical procedures for a number of weeks. The Johns Hopkins-Flirtey pilot flight imagines a scenario in which drones are sent from those ships to deliver medical supplies and collect biological materials, like blood tests, in devastated communities after a natural disaster. The tests could be used to assess illnesses amongst people in areas otherwise cut off from aid. Companies are piloting similar services in Africa and Europe, sources said. Drones have an advantage over trucks and cars when it comes to accessing disaster zones, though they can't carry heavy loads, like cases of water, Amukele told Bloomberg BNA. But they can deliver water purification tablets, which is a great benefit to populations cut off from clean water. Often times, disease kills more people than the initial disaster. Many diseases, like cholera, are waterborne, Amukele said. In the case of Hurricane Katrina, survivors were surrounded by non-potable water. “It starts to change relief support when you have a drone,” Amukele said. Flirtey is planning to offer the service at no cost to medical organizations, like Johns Hopkins and the American Red Cross, company CEO Matthew Sweeny told Bloomberg BNA. Flirtey began as an Australia-based company but eventually moved to the U.S. to attract investors and engineers. The company is now headquartered in Reno, Nev., near one of six Federal Aviation Administration-approved drone testing sites. “We got the first FAA approval for drone delivery service,” to homes, Sweeny said. That 2015 approval allowed the company to run a test emergency supply delivery in Virginia. A second approval this year permitted its ship-to-shore delivery pilots. Recently released FAA regulations allowing broad use of small commercial drones will enable Flirtey to expand its operations nationwide. Though there is a caveat—small drones are not permitted to fly over crowds and must stay within the operator's line of sight. Drone industry groups, like the Small UAV Coalition, have been lobbying Congress to make legal changes to those limitations, which they say could stifle innovation. There is a growing list of drone manufacturers seeking to get into the drone delivery spaces that are limited by FAA's requirements for within-line-of-sight and daylight-only drone flights, according to James Van Meter, who specializes in unmanned aircraft insurance at Allianz Global Corporate & Specialty. “That means that when you want to use drones for blood deliveries or when a natural disaster strikes, it actually limits the usefulness,” he said of the FAA rule. Van Meter works with several companies developing drone delivery services, though not with Flirtey, to make sure they are insured for potential liability in certain situations, such as if a drone dropped a package on someone. He said that although the FAA continues to impose a number of restrictions, lawmakers provided a bright spot for potential emergency drone service providers in a short-term extension of FAA spending authority (H.R. 636) enacted July 15 (See previous story, 07/14/16). The legislation includes a provision directing FAA to streamline its approval of drones needed to support emergency response efforts, which Van Meter said was welcome because it means the FAA will soon have a “quick, easy” mechanism to issue exemptions for those services. Relief services provided by drones like ship-to-shore medical supply deliveries is just a prelude of the many ways drone delivery services will be useful in the future, sources said. Flirtey, for example, is preparing to launch a litany of commercial delivery services, a potentially lucrative market that is being pursued by major players like Amazon.com, Inc.
“Going forward, there are really two players in drone delivery, and that's Amazon and us,” Sweeny said. Flirtey is angling to work with retailers, like Wal-Mart Stores Inc., Target Corp. and Ebay Inc., he said. The company also will seek partners in the fast food and package delivery industries, Sweeny said. He said there will be market demand for an independent drone delivery service that could work with a multitude of companies, and Flirtey plans to be at the top of that list. To see a video with interviews on ship-to-shore use of Flirtey's drones, go to https://www.youtube.com/watch?v=qPkN9y_mjPo&feature=youtu.be.